Life insurance is an important part of most any good financial plan. This is the case, regardless of how young or old a person is, and whether or not they have a spouse and children. One key reason for this is because most everyone will have funeral and final expenses. Today, the cost of an average funeral can be in the range of $10,000. This is because, in addition to the memorial service itself, there are other related costs. These can typically include the cost of getting a burial plot and a headstone, as well as the cost of transportation and flowers for the decedent's service. Often, loved ones will just simply not have that amount of money readily available. So, they may need to dip into their savings or even sell precious family heirlooms to come up with the funds. In other cases, paying these expenses may cause loved ones to go into debt. By having funeral insurance, though, funds can quickly be provided to family or other loved ones so that these expenses can be paid . For that reason, funeral insurance can be one of the best gifts that you can provide your loved ones with. Funeral insurance - which is also often referred to as either final expense insurance or burial insurance - is a type of life insurance coverage that is often sold to seniors, those who are age 50 and over. This coverage is geared primarily towards the payment of one's funeral and other ancillary expenses, and it can relieve family members or other loved ones from having the pay these bills out-of-pocket. Oftentimes, a funeral insurance policy will be whole life in nature. This means that the plan is considered to be permanent life insurance coverage. With whole life insurance, you will be guaranteed that the coverage will last - provided that you continue to pay the premium. In addition, the amount of the premium that is charged on a whole life insurance policy is guaranteed to never increase - even if the insured contracts an adverse health condition and therefore being considered a high-risk to the company, and even with his or her increasing age over time. In many cases, life insurance companies will offer funeral insurance with death benefit coverage of between $5,000 to $25,000. There are, however, cases where an individual could obtain a higher amount of coverage on a policy. There may also be some insurers that will allow the policyholders of funeral insurance to increase the amount of their protection. This can usually be done in increments of $1,000 or $2,000 - and often without the need to prove their evidence of insurability. Estimate the cost of funeral and other related final costs. One of the ways to come up with the amount of coverage that you may need is to contact several funeral homes that are in your area (or in the area where you plan your final interment), and ask about the average cost of a memorial service, burial plot, headstone, and other related expenses. In doing so, you may also want to consider adding amount of coverage for medical and / or end of life hospice costs that may not be paid for via your regular health insurance plan. Determine any legal and / or inheritance costs. It is also important to determine whether you will have any legal and / or inheritance costs. These can refer to probate and the expense of settling the estate. Also, if you do not currently have any other life insurance coverage in place, you may also want to consider whether you wish to leave a certain amount of money to your loved ones regarding an inheritance. Funds that are received by a beneficiary of a life insurance policy are typically able to obtain the money income tax-free. This means that the recipient can make use of the full amount of the proceeds that are received, without having to claim them on their annual tax return. Debts and / or Other Potential Needs. Likewise, if there is no other life insurance in place, or if the amount of life insurance that you currently have is not enough, you may want to consider the amount of unpaid debt you have that could end up being the responsibility of your loved ones. In this case, adding more to the coverage of a funeral expense policy can be helpful in ensuring that those you care about won't be put into financial hardship. There are some different factors that will come into play when determining the cost of a funeral insurance policy. These criteria are often very similar when pricing any life insurance coverage. Some of the key components of determining funeral insurance cost will include the age and the gender of the applicant. For example, because approval for life insurance is typically based on life expectancy, those who are older may be required to pay a higher premium than those who are younger. Likewise, because women tend to live longer - on average - than men, the premium for a male applicant may be slightly higher than that for a female, with all other factors being equal. There is also another big factor that can determine the price that you pay for funeral insurance. This is the life insurance company that you purchase it through. What many people may not realize is that all insurance companies do not price their coverage in the same manner. So, with that in mind, you could apply for a funeral insurance policy at one insurance company, and be given a completely different premium, rate than if you apply at another insurance carrier - even if you are applying for the exact same type and amount of protection. Therefore, it can be extremely important that you shop and compare more than just one funeral insurance policy before making your final purchase decision. If you end up keeping the policy for many years, even a slight difference in savings on the premium can truly add up. Who is a Good Candidate for Funeral Insurance? There is a variety of potentially good candidates for funeral insurance coverage. For example, many people who purchase this type of insurance are age 50 or over. A bulk of life insurance companies will accept candidates for funeral insurance until they are age 80 or 85 - and in some cases, an applicant may even be older. Also, because many funeral insurance policies will not require that a person take a medical examination as a part of the approval criteria, these policies can still be a good option for people who may have certain types of pre-existing medical conditions. So, even if you have been turned down for other types of medically underwritten life insurance coverage in the past, you could still be a good candidate for a funeral insurance policy. While many people may already have at least some type of life insurance in force, these policies may have been purchased for other purposes, such as for the payoff of debts and / or for supplementing retirement income of a surviving spouse. With that in mind, it can also be a good idea to have a funeral insurance policy that will specifically be earmarked for paying off one's funeral and other related final expenses. Doing so can help to free up the other life insurance coverage that is in place so that it can still be fully used for the intended needs, and the funeral insurance can pay for the person's final expense costs. In some instances, an individual may even want to make a funeral home he beneficiary of his or her funeral expense coverage. That way, the costs can immediately be paid to the company for its services. Here, if there are any proceeds remaining from the policy, these funds can be paid out to a named beneficiary who is a family member or other loved one. 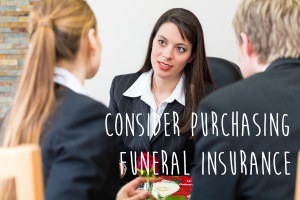 When you are shopping for a funeral insurance policy, there are several factors to consider before you make your final purchase decision. These can include the amount of benefit that you need, as well as the type of coverage that you are seeking. It can also include the insurance company that you are purchasing through. In addition to comparing only premium prices, you should also do a review of the insurance company that you are considering buying the coverage through. This is because you will want to be sure that the insurance carrier is both strong and stable from a financial standpoint and that the company also has a good reputation for paying out its claims to policyholders and beneficiaries. One way to check the reputation of a life insurance company is to review the ratings hat have been given to it by the insurer rating agencies. These include A.M. Best Company, Standard & Poor's, Moody's, and Fitch. In most cases, these agencies will rate insurers using letters between A and F. It is often best to stick with the company that have a rating of A or better. Another way to check out the reputation of a life insurance company is to view their grade and reviews on the Better Business Bureau website. Often, even if an insurance company is not an accredited member of the BBB, they will still be provided with a letter grade of between A+ and F, and any complaints and / or review will also be available to view. You will also want to consider how - and how much of - the death benefit will be paid out on the funeral insurance policy. This is because not all policies will pay out 100% of the stated death benefit amount unless or until the insured has had the policy for a certain amount of time. As an example, in some cases, if the insured dies within just the first year or two, the policy's beneficiary may only receive a certain percentage of the total stated death benefit amount. However, after a certain amount of time has passed, such as two or three years of policy ownership, the beneficiary would be eligible to receive all of the stated death benefit upon the insured's passing. When seeking quotes on funeral insurance coverage, it is typically best to work with a company or an agency that has access to multiple different life insurers. In doing so, you will be much better able to compare the policies, the benefits, and the premium prices. Then, you can determine which will be the best for you. If you are in the process of looking for a funeral insurance policy, we can help. We work with many of the top life insurance carriers that are in the marketplace today, and we can assist you with obtaining all of the important information that you will require for making a well-informed purchase decision. When you are ready to move forward, all you have to do to start the process is just simply take a few moments to fill out the form on this page. Should you find that you still have any additional questions or concerns, we can assist you. We can be reached via phone, toll-free, by dialing 877-235-9299. We understand that the purchase of life insurance can seem a bit overwhelming. But we are here to assist you through the entire process of finding a policy and the best premium quote. So, contact us today - we're here to help.